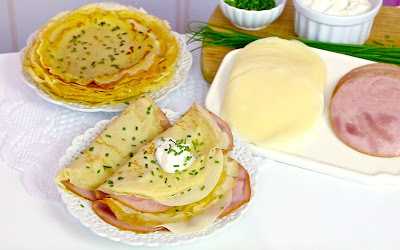 Simple, golden brown crepes, studded with fresh chopped herbs and stuffed with ham and cheese. 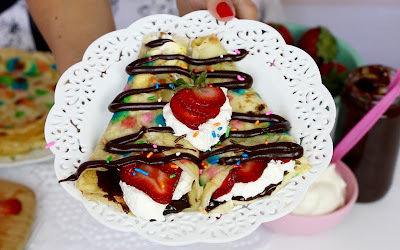 Perfect for breakfast, lunch or dinner! You can make them in advance too, so just freeze and reheat when you're ready to serve, for fresh homemade crepes any time. It only has a few ingredients, water, eggs and butter... and my secret ingredient, pancake mix. 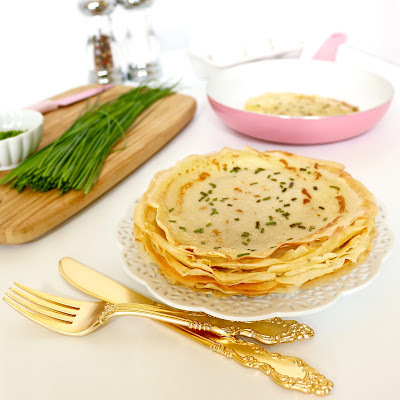 I always refrigerate the batter for about an hour before I cook them, to let the mixture rest for the most delicate tender crepes. 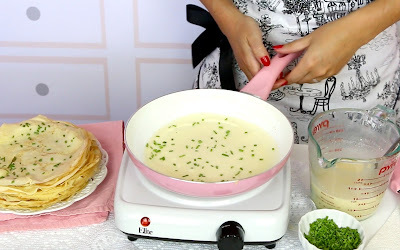 Pour 3-4 tablespoons of batter into the center of a non-stick pan and tilt it around to coat the entire bottom of pan evenly. I find an 8-inch pan is a lot easier than the heavy duty larger pans. 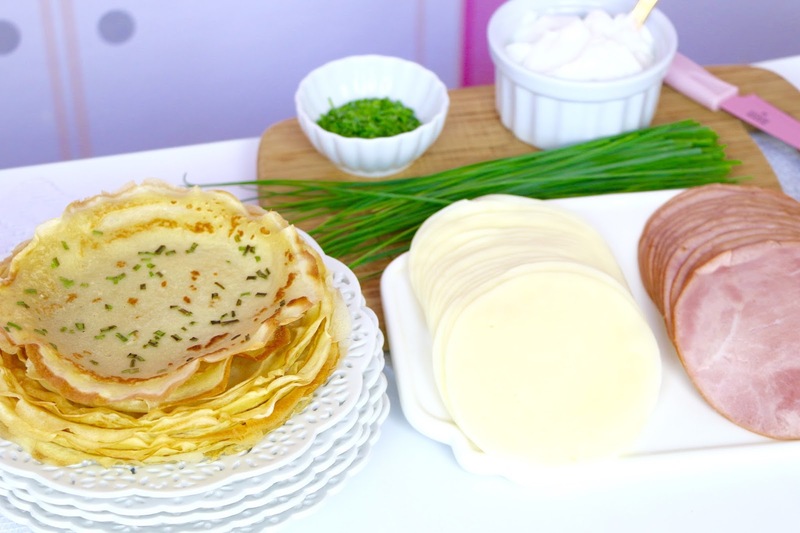 Add chopped fresh herbs to the crepe batter while it is still wet and cook it for about 1-2 minutes, until the bottom is lightly browned, then loosen the edges with a spatula, flip, and cook the other side for about 30 seconds. How easy was that?! Know that, the first few might not come out perfect, but give it a few tries and you will get the hang of it. Add some slices of ham and cheese, fold it over, and finish it off with some sour cream and chives. Gently spoon pancake mix into a 1 cup measuring cup and level it off with the back of a knife. Whisk the mix in a medium bowl to remove any lumps. 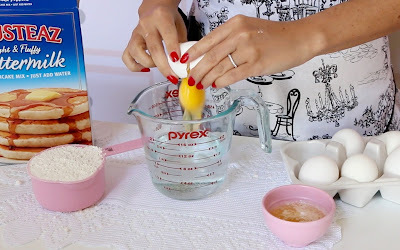 Whisk together the water, eggs, butter, salt and pepper in a measuring cup and slowly pour over pancake mix, beat with a hand mixer for about a minute on medium speed until thin and smooth, or alternatively pulse ingredients together in a blender. 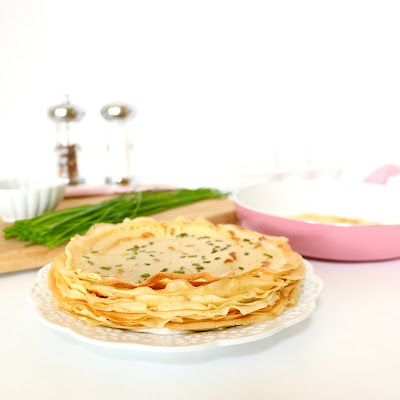 Cover and refrigerate for about an hour, or up to 24 hours. Lightly grease an 8-10-inch non-stick pan over medium to medium-high heat. 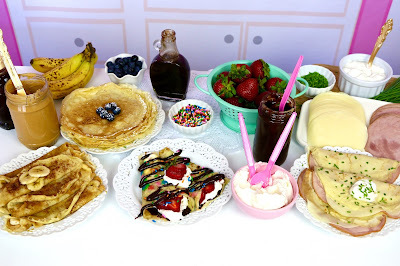 Stir crepe batter to combine all ingredients. 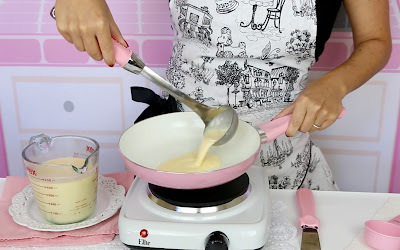 Pour 3-4 tablespoons of batter into the center of pan and tilt it around to coat the entire bottom of pan evenly. 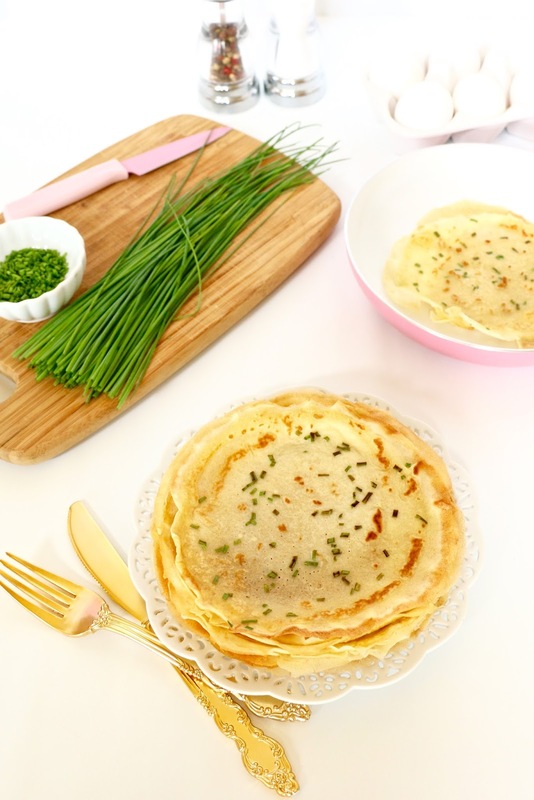 Sprinkle on some fresh chopped herbs to the crepe while it is still wet on the pan. Cook for about 1-2 minutes, until the bottom is lightly browned. 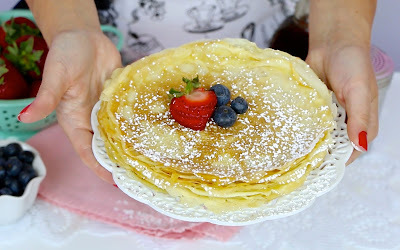 Loosen the edges, flip, and cook the other side for about 15-30 seconds. 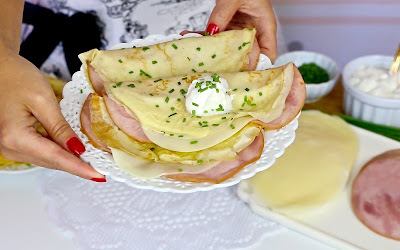 Add a few slices of ham and cheese, fold it over and serve warm, or store crepes in a Ziploc bag in the refrigerator for a few days or freeze for up to two months and reheat when ready to serve. Add scrambled eggs for breakfast, or sautéed spinach and mushrooms for dinner, if desired. 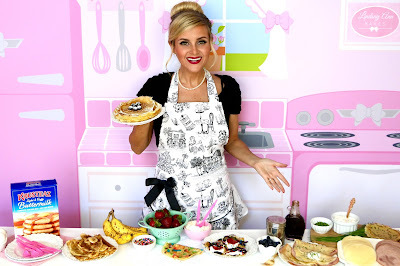 Disclosure: This post is sponsored by Krusteaz, however, as always, all recipes and opinions are my own.